Indeed we did get our hands all over the DROID RAZR, Motorola’s newly announced “thinnest smartphone in the world.” If I had one word to describe this phone, I’d easily go with thin. It really is the thinnest device I’ve ever touched at just 7.1MM thick. Is the rest of the package enough to get people out of the Ice Cream Sandwich and Galaxy Nexus mood though? Tough call, but I can definitively say that I’m a fan after this event. It’s 4.3 inches of Super AMOLED “Advanced” goodness. Pretty sure it’s still PenTile, but it’s most definitely not the same PenTile that was on the Bionic and DROID3. As you can see from our close up shot below, there are far less black dots and a lot more straight lines. It looked fantastic in both video and hands-on demos. It’s packing a 1.2GHz dual-core OMAP (though our guy wasn’t sure which OMAP) and 1GB of DDR2 RAM. This phone flies. 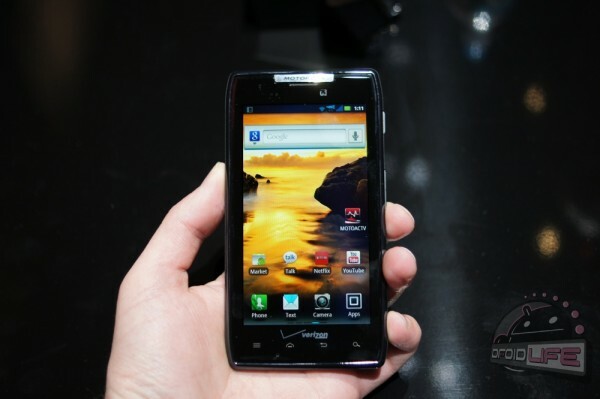 If you thought the Bionic felt polished and smooth, just wait until you get your hands on this phone. Also has an HDMI port, 16GB of on-board storage, 8MP rear camera (1080p video), and a 1.3MP front camera that can do 720p video. 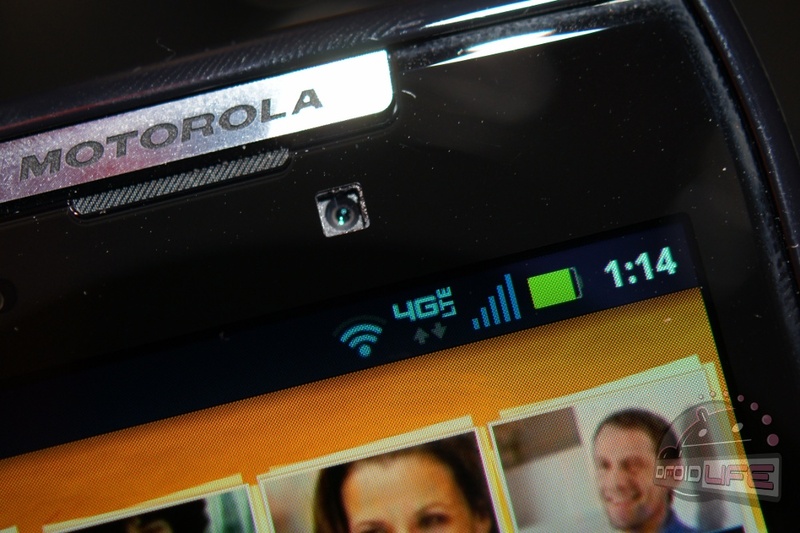 The phone feels amazing in hand and that’s because Motorola always seems to use quality materials. It’s lighter than any of their other devices, but it still feels like Moto. The kevlar casing on the back is a nice touch along with the splash guard for protection. The real story here is how thin this phone is. It’s almost hard to explain. 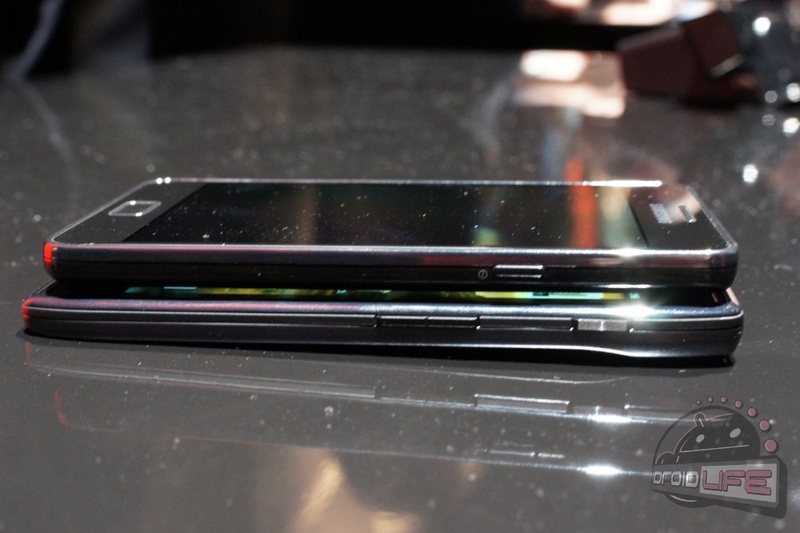 Check out this comparison shot to the Galaxy S2 to get an idea. Non-removable. Everyone OK with that? I have a feeling that this is the way of the future for Android phones. Our sources told us months ago that the Dinara would have a non-removable battery, so it doesn’t surprise us that this phone does as well. It’s 1780mAh though, so it should last you through a day, especially with all of the software tweaks that Motorola has claimed to have done. So we walked through the phone a number of times with one of the Moto reps who has made this his daily device over the last month or so. 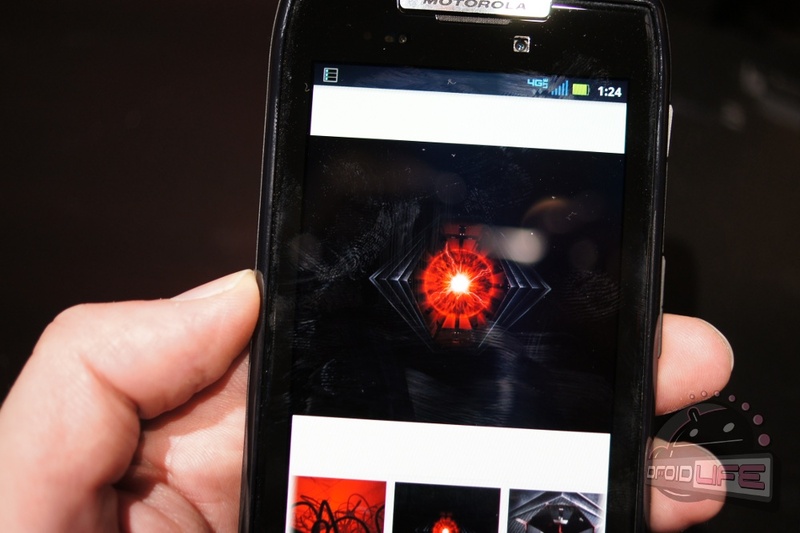 He showed us that MotoCast has been fully incorporated into the system to actually make it useful. Things like making playlists from both on-device music and music that is stored on your computer was one of the examples he used. It may seem like bloatware, but they appear to be fully invested in the cloud, something we like. We did not get a response on the bootloader situation, but Moto Twitter already took care of that. It’s locked. HDMI and microUSB are on top – just found it awkward, especially when docking. SIM and micro SD slot are where the HDMI and USB normally are. With a non-removable battery, all of this stuff has to be accesed from the outside. Can utilize Netflix HD videos. Should be the first on the planet for Android. Lock screen now has a direct-to-camera option. Check out the rest of the gallery below for more fun.